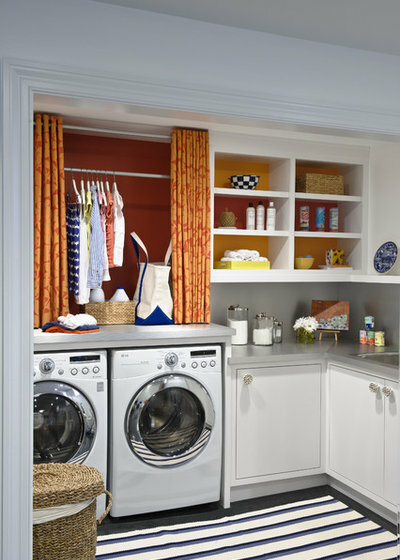 It's almost impossible to make washing clothes fun, but having a well-organized and beautifully designed laundry room can certainly help. 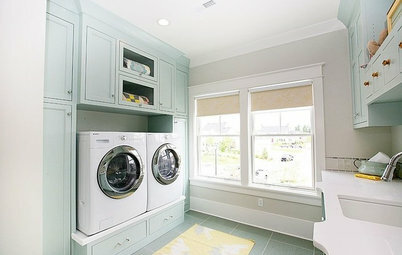 This year Houzz readers saved photos of laundry rooms that used less space without diluting style. 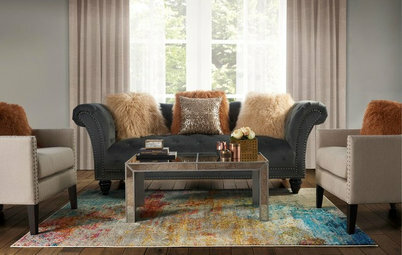 Smart layouts and great storage ideas helped to make the most out of these fluff-and-fold areas. 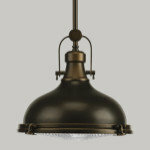 Check out the most popular laundry room photos of 2012, as determined by the number of Houzz ideabooks they were added to. 1. Single-wall savvy in New York. 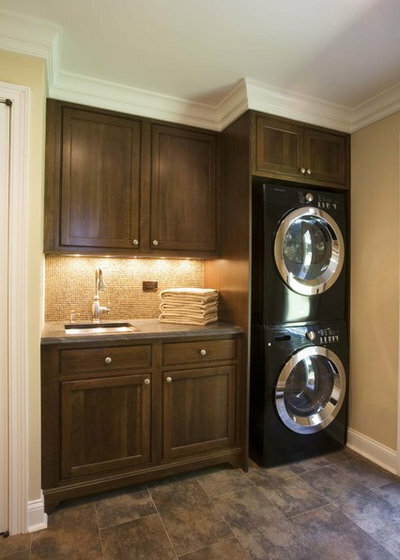 A stacked washer and dryer can save space, as seen in this simple laundry room. 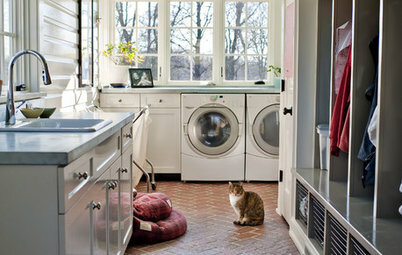 Houzzers liked how the laundry area took up only one tiny wall — an idea that can easily work in smaller homes. 2. Purple cabinetry in Minnesota. 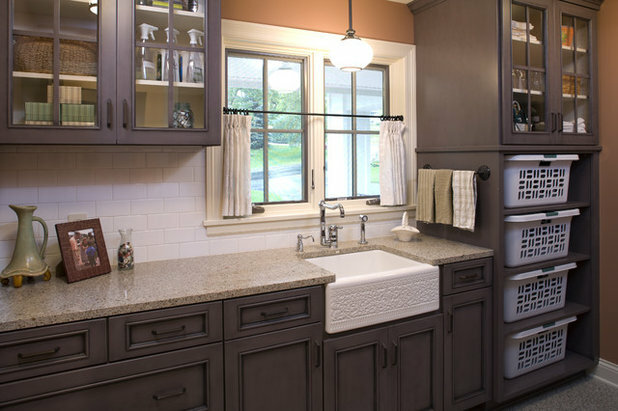 Purple cabinetry is a bold choice, but this laundry room tones it down with gray undertones.The etched detail on the sink, traditional hardware and warm wall color help tie the rest of this quaint room together. 3. Colorful Minneapolis laundry area. 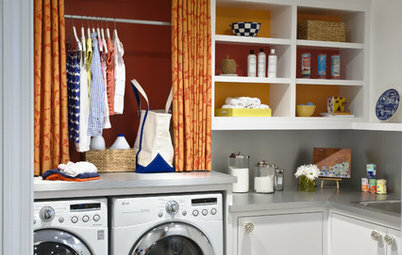 Small spaces like laundry rooms can be great places for bold color. Houzzers took a cue from this one, saving this photo for its brightly painted shelves and handy hang-dry space. 4. Violet walls and marble floors in California. 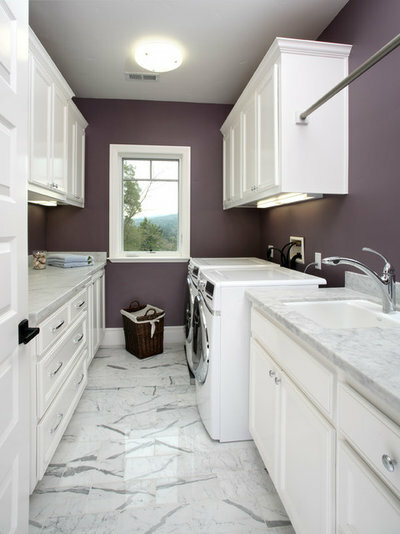 Purple laundry rooms were a hit in 2012! The contrast between the rich wall color and the marble countertops and floor tile here makes it easy to forget that this attractive space is actually a laundry room. 5. 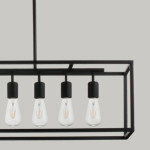 Smart storage in Brooklyn. 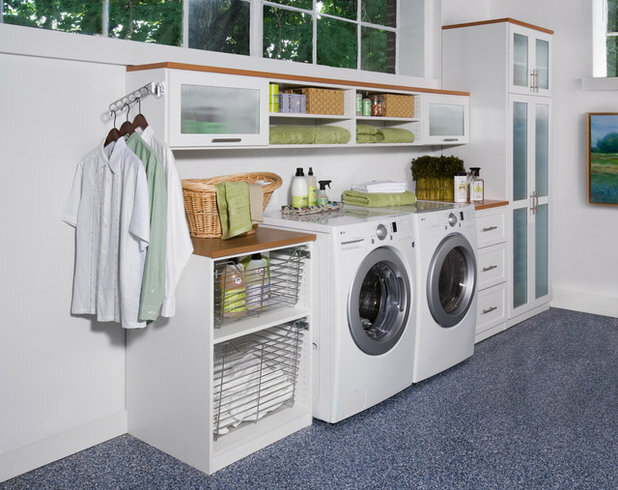 Different cabinetry types in this New York laundry room inspired Houzz readers to mix up storage ideas in their own homes. 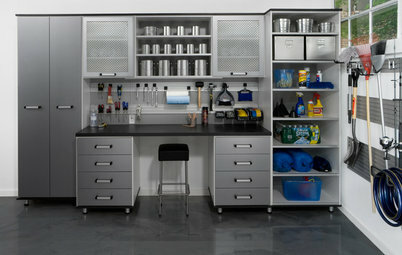 Wire drawers, deep cabinetry and shelving above the washer help keep everything neat. 6. Witty labels in San Francisco. 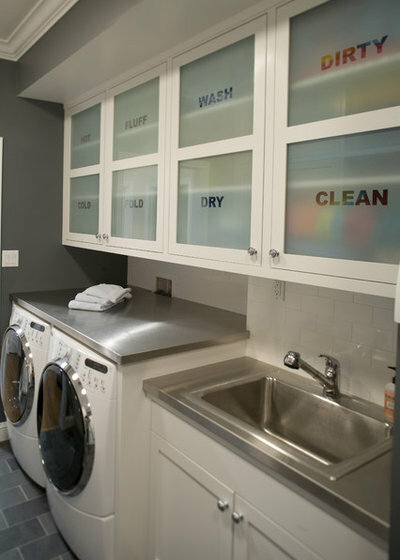 Frosted glass cabinet doors help streamline the laundry process. Houzzers also noted the handy stainless steel table on top of the washer and dryer, perfect for folding clothes as soon as they're dry. 7. Small space with stained glass. 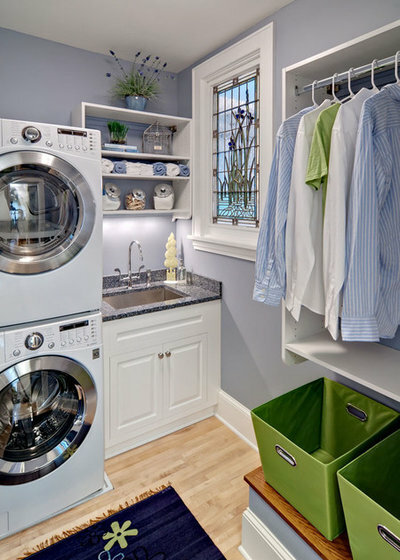 A stacked washer and dryer, a small sink and a spot for hanging clothes make the most out of limited square footage. 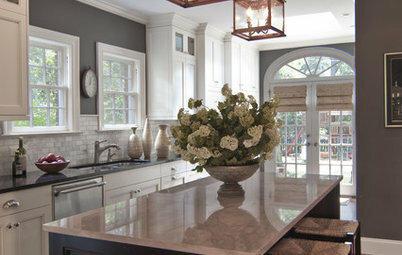 Houzz readers also loved the beautiful stained glass window. 8. 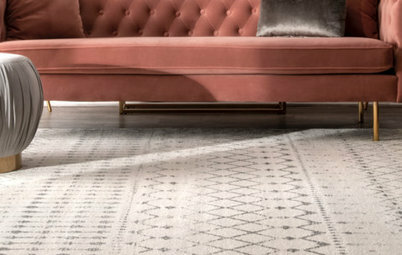 Patterned walls and floors in Southern California. 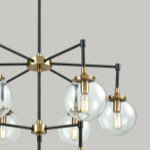 A narrow setup gets a bold treatment with patterned wallpaper and checkered marble floors. 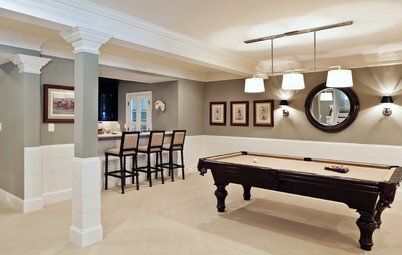 Houzz readers saved this photo for its fun pattern play but also noted the smart layout. 9. Warm brick floors in Kentucky. 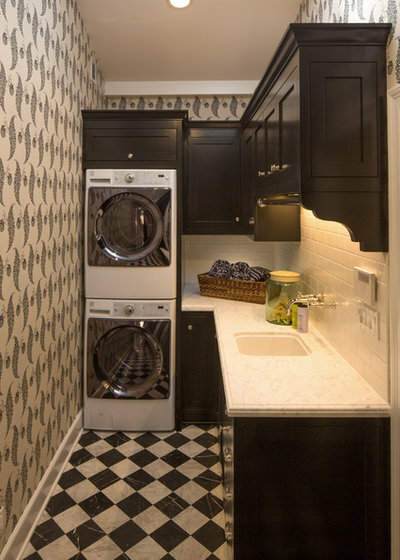 The herringbone brick floor adds an unexpected element to this cozy laundry room. 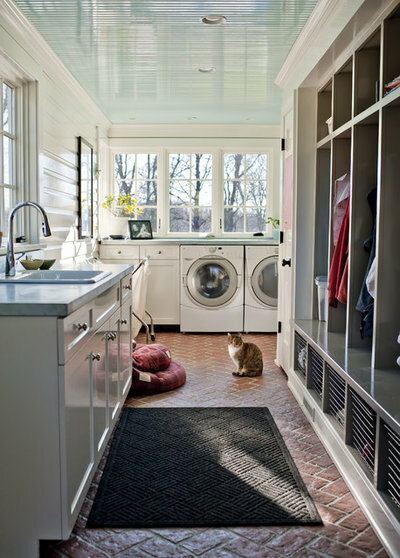 Houzzers loved the burst of color from the glossy turquoise ceiling too — and, of course, a few mentioned the sweet cat. 10. Custom drying drawers in Washington. 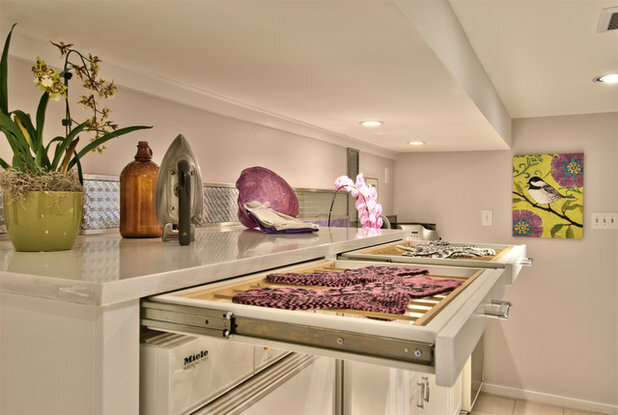 This creative idea eliminates the need for bulky drying racks in a laundry room with limited space. Custom drying drawers like these can hold delicates and other small items that need to air dry. 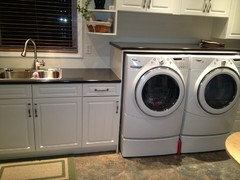 I built our cabinet counter top above the washer and dryer to be removable, held down with one screw. 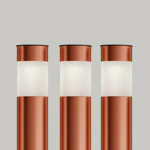 This allows access for connection of water lines, electrical, and or gas connection. 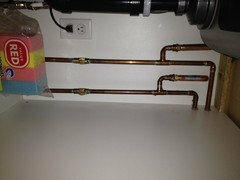 The actual water valves need easier access, so they are hidden in the adjacent cabinet under the sink.